Heat coals or gas grill for direct heat. Cut a circle 1/2 inch from edge of bread, cutting 2 inches down into loaf but not all the way through. Remove center of bread loaf and set aside. Arrange salami inside bread loaf; top with peppers, tapenade and cheese. Place center of bread loaf over filling to fit tightly. Wrap tightly in aluminum foil. Cover and grill loaf 4 to 6 inches from low heat 15 to 20 minutes, turning once, until cheese is melted. Brush olive oil over top of loaf. Cut loaf into 4 wedges. 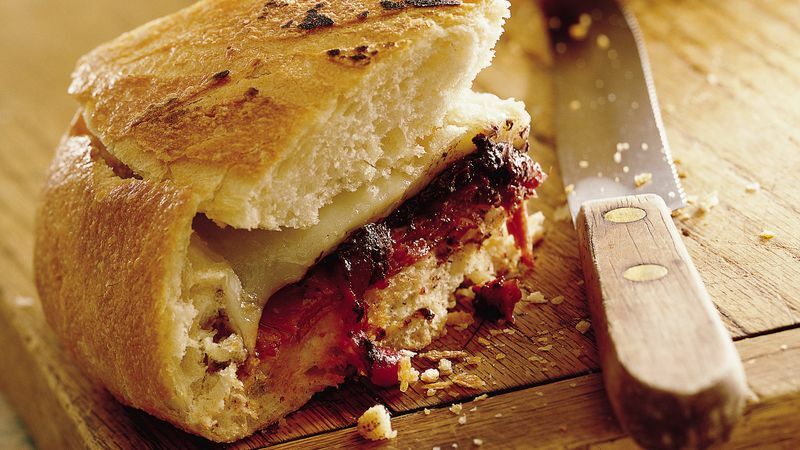 Most any type and flavor of bread will work for grilled panini. A 1-pound loaf is a good size. Shape isn't that important-round, oblong or narrow all work well. Avoid focaccia, which isn't thick enough to cut as directed. You can use 1/2 cup basil pesto instead of the tapenade.